When you buy a property in Spain, once the interior is developed to your satisfaction, you’ll want a garden that looks as good and is appropriate for an outside lifestyle. There are many ways to approach this and I'd just like to pass on some ideas I have come across. natural stone in an informal crazy paving style – running this same stone through all steps and paths. Then coloured pots can be positioned to add interest to the terraces, perhaps planted with colourful sweet smelling geraniums. On the other hand, if there’s a terrace where you enjoy an evening glass of wine or two, be sure to place a plant called "Galan de Noche” nearby. In English it’s called "Lady of the Night” and that’s because its little white flowers release their intoxicating scent at night. Another plant that will grow and cover speedily, is the trusty.Bougainvillea. Its flower colour range is excellent, the most common being a gorgeous magenta – but crimson, deep maroon, orange, pink and white are also readily available. Another "must have” range of plants, especially for seating areas and the entrance to the property, are those with perfume. Here you are urged to consider jasmines, roses, lavenders, gardenias, mock oranges, stephanotis and the fast growing frangipani vine, along with freesias and lilies. There are lots of centres around that produce and sell statues in a variety of shapes and forms – from small animals, elves (I hesitate to call then gnomes) and toadstalls to elegant toga clad ladies holding urns or playing an instrument. We opted for this latter category. If your garden site is indeed sloping, then it’s a good idea to build a few retaining walls, especially around your terrace areas, then back-filling them with topsoil will give you useful planting areas, with rocks forming attractive compartments for pretty trailing evergreen plants with remarkable and colourful flowers. Of course, flowers are an essential ingredient of your garden, but don’t forget the architectural types of plants – like aloes and cordylines. They can be as stunning as any bed of flowers. We have, with some reluctance, decided against ponds or water features in our garden. The fear of providing breeding facilities for mosquitos outweighed our love of the sound of trickling water around our reading locations. Have a comment on Creating a garden in Spain? This plant is a must for any garden on the Costa Blanca and will be ideal in any Moraira or Javea garden. It has very distinctive spiky yellow and orange flowers which give the appearance of bird crests, they are very unusual and if cut last a long time in water. They are excellent grown in pots or in the garden and the foliage is evergreen and has large spear like leaves in a grey-green. The plant is a member of the banana family so will only tolerate a light frost and temperatures below -2 degrees Centograde coluld damage the flowers and leaves. They need rich soil and frequent feeding. The plant flowers during spring and autumn and winter. 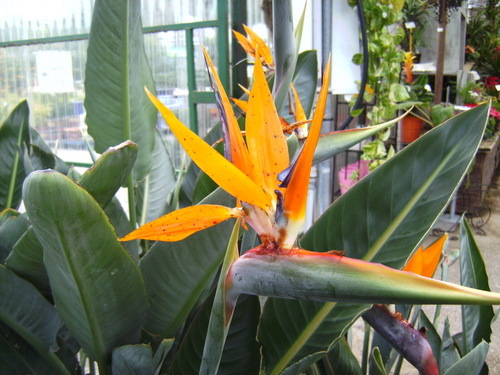 They are readily available in garden centres throughout the Costa Blanca. Many Moraira villas and Javea properties enjoy this plant. Have a comment on Strelitizia Reginae plant? This is very distinctive plant and gives a beautiful splash of colour in the winter with bunches of yellow flowers in spikes on the tops of the branches. The plant has dark prickly leaves similar to holly but not quite so prickly and when the flowers have finished, produces blue-black berries which are popular with birds. It makes a beautiful ornamental plant in any moraira or javea garden and is available at most garden centres. 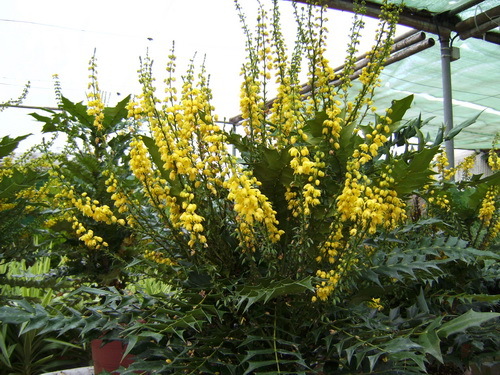 Have a comment on Mahonia (Oregon Grape)? This is a beautiful evergreen tree which bears small clusters of very pretty bell like white flowers in late autumn and at the same time has very bright ornamental yellow strawberries which turn a very bright red. These strawberries are edible but are very dry and do not have much flavour. This tree looks extremely attractive in any garden and the leaves are attractive in the winter as they are dark and quite shiny. They do not transplant well, so always buy a container grown one. These plants are readily available in most garden centres. 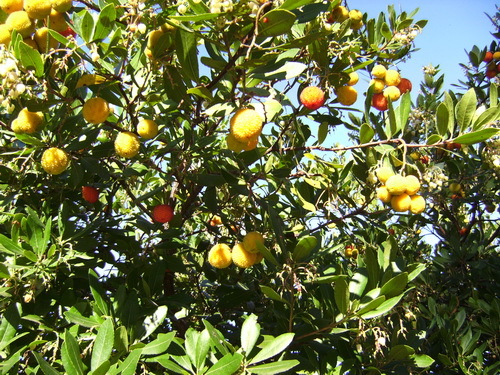 Have a comment on Arbutus Unedo (Strawberry tree)?